Despite the fast-growing popularity of smart wearables, especially those for health and fitness tracking devices, there’s a little-known fact that around 50% of users lose interest to these gadgets within a few months. Since most of the fitness tracking wearables available on the market only offer technical-fashioned and monotonous data on steps and calories burnt, it is difficult for them to motivate and engage users in the long term. Mars Zhu and Hazim Abdul Hamid, two former colleagues at renowned marketing communications brand JWT, spotted business opportunities in this tendency and co-founded tech startup Noodum to tackle this problem. I was able to sit down with Noodum CEO Mars Zhu to get a peek of their first offering–Wokamon. With the aim to get people excited about exercising, Wokamon (short for Walking Monsters) sets to gamify the exercising process by combining a GPS-enabled pedometer with a virtual pet. The principle of this app is quite simple– the more you move, the more your pet grows. The tamagotchi feeds off users’ burnt calories and turns them into happiness credits. Users can check the daily progress of their Wokamon, which will level-up as users exercise more. With five characters to start with, the long term goal is to unlock all Wokamons. “The virtual pet seemed like a great way of visualizing and giving virtual life to your real-world activity,” says Mars Zhu, co-founder of Noodum. Additionally, the app is opened up to users’ current fitness tracking hardware in a bid to lower the entry thresholds. 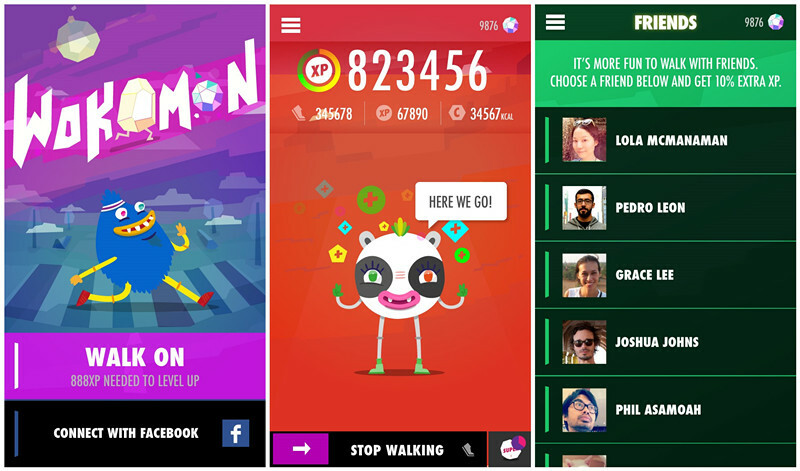 Wokamon can sync data from user’s existing fitness wristbands and apps, including Fitbit, Jawbone, Moves, a fitness and activity tracking app Facebook acquired this April, etc. As of 2013, an estimated 6 million fitness tracker devices are in use, with 1 in 5 smartphone users having installed a health tracking app. A virtual pet gives users an altruistic reason to stay engaged with their tracker, limiting dropoff rates in the category, Zhu said. The co-founder added that users of different wearables brands or fitness apps only can interact with other members of the same community. Wokamon’s engagement of different devices and apps can help to break these boundaries and create a cross-platform community. “It’s a fun, casual way to monitoring your fitness and state motivated as you progress through the game”. Zhu pointed out that the number of times a user syncs its fitness data on hardware to apps is a key index to gauge the active degree and stickiness of device users. Wokamon’s syncing times is seven times more frequent than that for regular fitness wristbands, according to a test run by the company. Users sync their data more frequently because they can’t wait to see the growth of their virtual pets, Zhu explained. The company planned to monetize the services from paid characters, virtual currencies and tools, as well as derivative products like T-shits and toys. Launched for only half a month, the startup is still in its infancy and mainly operated by the two co-founders. Mars Zhu, who has more than ten years of software development experiences, oversees the technical unit of the company. The other co-founder Hazim Abdul Hamid, a talented Australian designer and illustrator, is in charge of designs for app characters, backgrounds and interface. The characters currently available on the app marked Hazim’s vibrant colors and naïve style. 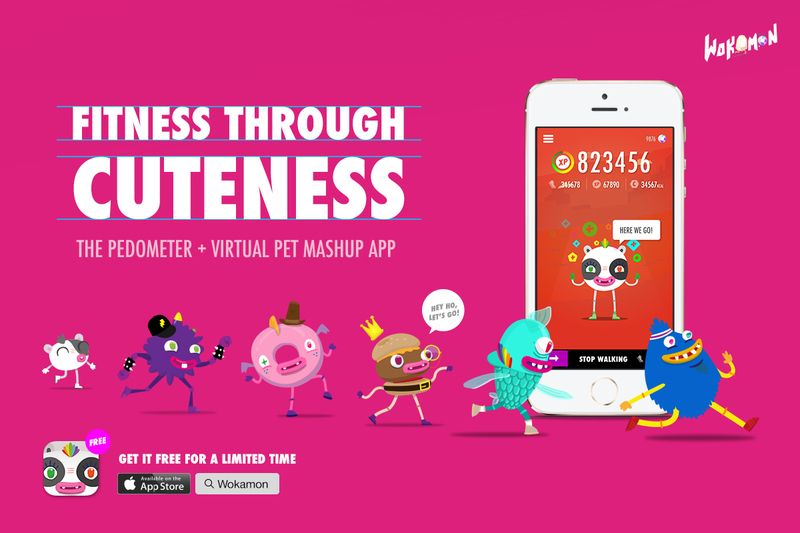 Zhu referred to their virtual pets as ugly cuties jokingly. In addition, the startup is planning to diversify their character styles by inviting more famous illustrators to join the designing team, which in turn will also attracting their fans to use the app.